Well, I am back down to 146.2 this AM. Yay. Feeling much better after a couple of days of clean eating! There is an open bag of potato chips staring at me here at the office and I am just saying NO! It would be so easy to just grab a handful. But NO! Just say no! I’m thinking about how strong I am. When I first started on my journey last year, it was a battle to refuse muffins here at work. But I did it…so chips will be easy to refuse too! Well, our last summer vacation is over! We had a really great summer, but truthfully, part of me is glad that we’re done with vacations for now. I didn’t revert all the way back to old ways, but with each week on vacation, I got more and more comfortable with eating bad unhealthy foods. Yes, I worked out every day on vacation, but I feel so icky and unhealthy inside. I feel bloated, gross, and fat. I know I’m not fat, but I don’t feel “right”. I hate that I’ve come this close again to poor choices. I hate that I feel helpless. Helpless because I know what’s right, but I can’t stop myself from making the wrong decision. Example. We got ice cream close to every day last week. Not that bad because we were walking almost a mile (up/down hills) to the ice cream stand, and I was only getting kiddie portions. But one day, while out driving, we stopped for ice cream, and I got a kiddie cup and couldn’t stop myself from also ordering a piece of chocolate cake as well. I knew it was wrong, I knew the ice cream was enough of a treat, but my compulsion took over and won the fight. Ugh. It was not a good feeling, and it’s shameful looking back on it now. And that’s why I am glad vacations are over. I can hopefully get back to healthy eating, and get back to feeling fantastic inside and out. I don’t want to beat myself up too much over this, because that is not a healthy attitude either. I know that an occasional treat can be beneficial and I can’t obsess over it! There has to be a balance between good and evil. But for the most of the month of August, the evil was tipping the scales! Weighed myself this AM, and thankfully, I’m 147.6 – Saturday when we got home (mid afternoon), I was 149+ so it’s a relief that I haven’t gained as much weight as I feel like I have on the inside. Today is Monday, new day, new week! I am going to do better! Not going to obsess over my bad choices. Just get over it, and move on. I have to remember to take each experience as a lesson to learn more about myself! The more I realize about myself, the more powerful I become, and the less power the compulsion will have! 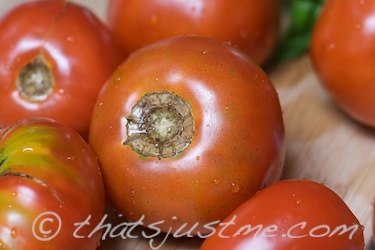 Maria, my Facebook buddy, informed me that you can indeed freeze raw whole tomatoes…awesome! I wish I knew this BEFORE picking up my CSA veggie share this week, as there was a “take as many as you can use” box of free “seconds” tomatoes that were bruised or gouged! I didn’t take any because I didn’t want to overload myself with too many tomatoes, as there were several already in the share. So, I googled, and it looks like you can freeze raw tomatoes either whole or in pieces. Well, it’s either my lack of actual exercise that’s catching up with me, or maybe my occasional “cheat” is the culprit. Hmm, could be the time of month too. But I will not allow it to get me down. So, I’m up a little bit. It’s going to happen every once in awhile. I just have to do the best I can and live as healthy as I can. Don’t let it worry me too much. I am sure I will be on the downside again very soon! It’s been a rough couple of weeks, with my biopsy and my mom’s operation. I think it just caught up with me. I had an amazing dinner tonight! 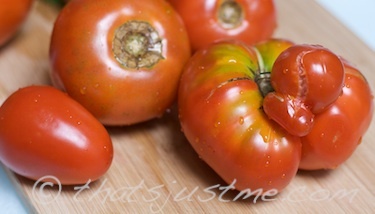 I recently picked up the CSA share for the week and there was an abundance of wonderful tomatoes! I knew I had to roast some for pasta. I sliced the heirloom tomato we received, plus one roma and two slicing tomatoes, and I mixed them in a baking dish along with some chopped pepper, onion and basil leaves. Came back yesterday from a week long RV/ATV vacation. It was lovely. Lots of nature! Lots of time to just relax and have fun! Taking my mind off everything at home. I didn’t even bring my laptop with me. I did bring the dSLR camera, but I rarely took any photos. My iPhone camera worked for capturing a few memories. So how did our healthy lifestyle do? We were on vacation, so of course, that means tempting treats. I was bad! Lots of sugary fatty foods like these fabulous “Persian danish roll” things. Honey glazed pastries, with a layer of maple icing, then topped with crumbly sugary crunchies. I had THREE of them during the week. 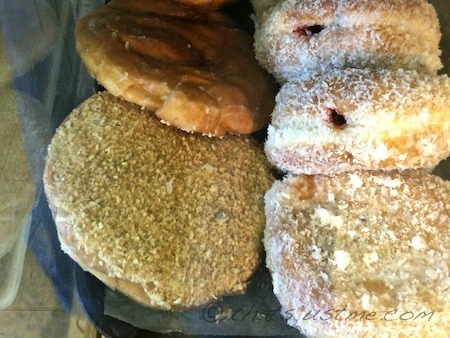 The bakery in town was a quick drive by car or ATV so we gave ourselves a few treats! This photo doesn’t do it justice! That’s the Persian on the bottom left. There was also ice cream sundae (kid’s), fried clams, lobster roll (no mayo), seafood chowder, poutine fries, carrot cake, macaroon cookie, ice cream cookie sandwich, lasagna, 2 slices of pizza, and a fried egg & bacon sandwich. To make up for some of our indiscretions, we took long walks once, twice or more daily, and actually ATVing works your muscles fairly well. Even on the back of the ATV, I was keeping my balance and holding on! So, it’s back to reality and back to eating right. I weighed in this AM and I was about 148. Not too bad. I’ve decided not to fight the overwhelming urge to cheat on vacation. I just have to keep in mind that in order to cheat, I need to work out and STOP the cheating when I get home! So far it’s been working out well! UPDATE August 9, 2010: 147.0 on the scale this AM! yay!